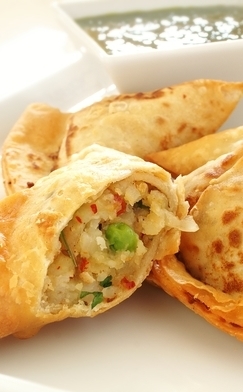 These Tasty Pockets Are One Of The Most Popular Snacks In India! After Trying Them We Can See Why! Anyone who is familiar with Indian food is likely familiar with this delicious appetizer. Samosas are a fried and stuffed pastry with a savory (although sometimes sweet) filling and they are one of the most popular snacks all over India. A large number of fillings can be used like sweetened coconut, or even minced meat. Mix all the dry ingredients together for the pastry dough. Add the oil into the flour and mix well together until the flour holds itself together. Add the water in small portions, mixing the dough after each portion until well mixed. Once the dough comes together, work it for another 5 minutes, then wrap in plastic wrap and let rest for 30 minutes. For the filling, boil the potatoes. Cool, mash, and set aside. Heat oil in a skillet. Add the cumin seeds. Once they start to pop, add the chili and onion. cook until the onion becomes translucent. Add the peas and turmeric. Once the peas are cooked, add the remaining filling ingredients including the mashed potatoes. mix well, then set the mixture aside to let cool before using. Roll a lemon-sized ball of the dough into a 5″ circle with a rolling pin. Cut the circle in half, forming two semicircles. Add about ball of the potato mixture into the center. Dip your finger into water and rub it along the straight edge of the semicircle to make the dough wet enough to stick. Pick the samosa up from one side and place it over the potato ball, covering it half way. Pick up the other corner and place it over the previous one, covering the potato to make a triangle shape. Set the last un-folded end of the dough, and fold it over the overlapping corners to make all of the flaps stick together. Repeat the process with the remaining dough. Add the samosas to a wok or deep fryer with enough room temperature oil to cover. Begin to heat the oil on high and cook until the samosas turn a golden brown. Remove from oil with a slotted spoon and set on a place of paper towels to drain. Serve with a sauce or chutney.